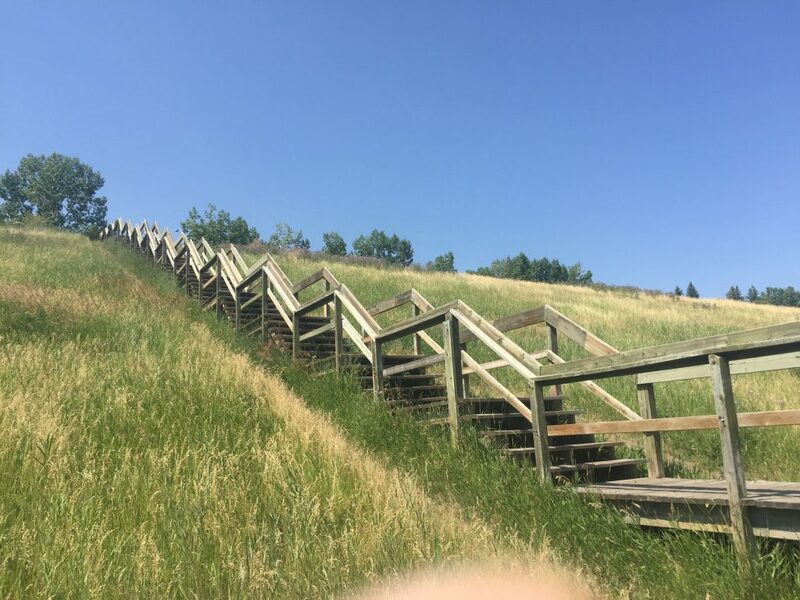 The Memorial Stairs, which climb McHugh Bluff from the Calgary Curling Club to Crescent Road NW, are a Calgary institution. 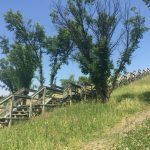 On nice days (and not so nice ones) hundreds of locals run, walk and jump up and down these stairs in a quest for cardiovascular fitness and glory. 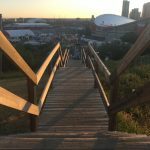 If the activity is your cup of tea but the crowd isn’t, you’ll want to try Calgary’s other outdoor stair training sites. 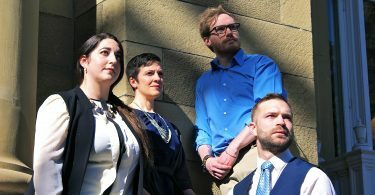 Here are 6 great options in ascending order (ahem) of steps. These wooden steps lead up from the corner of Edgemont Blvd. and Edgevalley Dr. NW to the Edgemont Community Association. 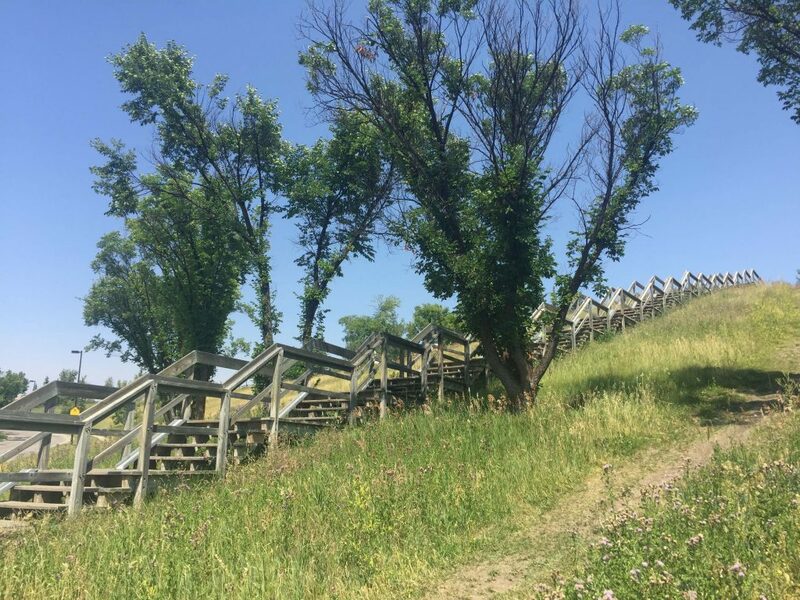 The hill is covered with prairie grass and wildflowers, and the staircase is split into small sections of about five steps each, making this a great place to ease into training, do a recovery workout, or try running stairs for the very first time. 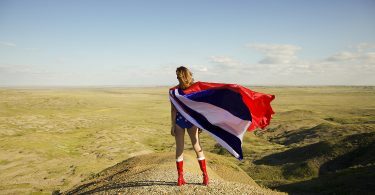 Plus: This flight is very low-traffic, which means you can do flailing plyometric jumps and such without fear of slapping a nearby runner in the neck. Park on Parkland Blvd. SE just north of the Parkland Cres. SE junction and look for the wooden railings on the edge of the hill. 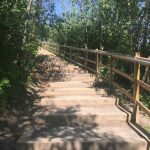 You’re just a few blocks from Fish Creek Provincial Park, so these steps make a great detour if you’re looking for a more intense workout. 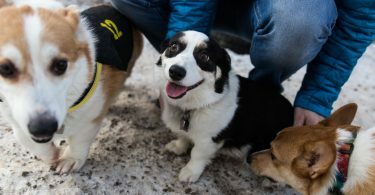 The view is of Bow Bottom Tr. SE and a cluster of big box stores, but somehow these steps — surrounded by prairie grass and cricket song — are pleasant anyway. And if you need a boost post-workout, you’ll know exactly where the nearest Tim Hortons is. 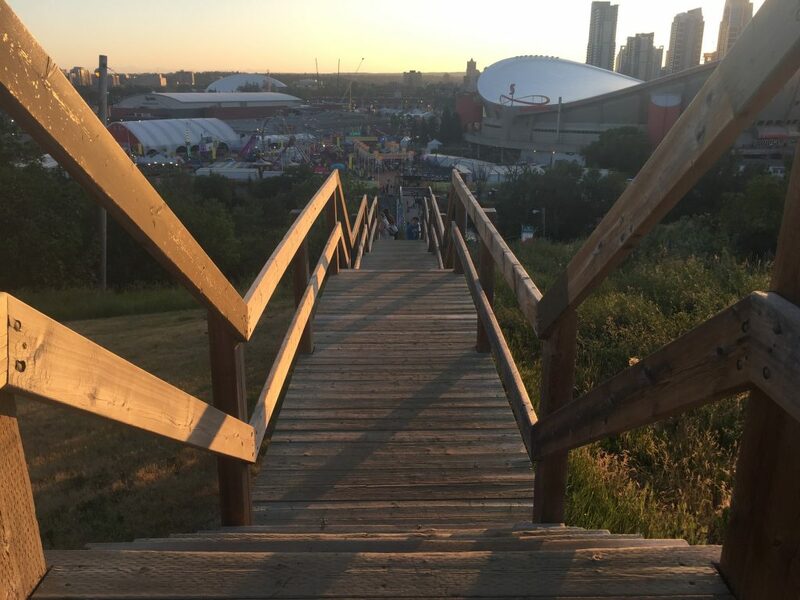 Add a hill run: There are worn paths on either side of the steps, so you have hill-running options here too. 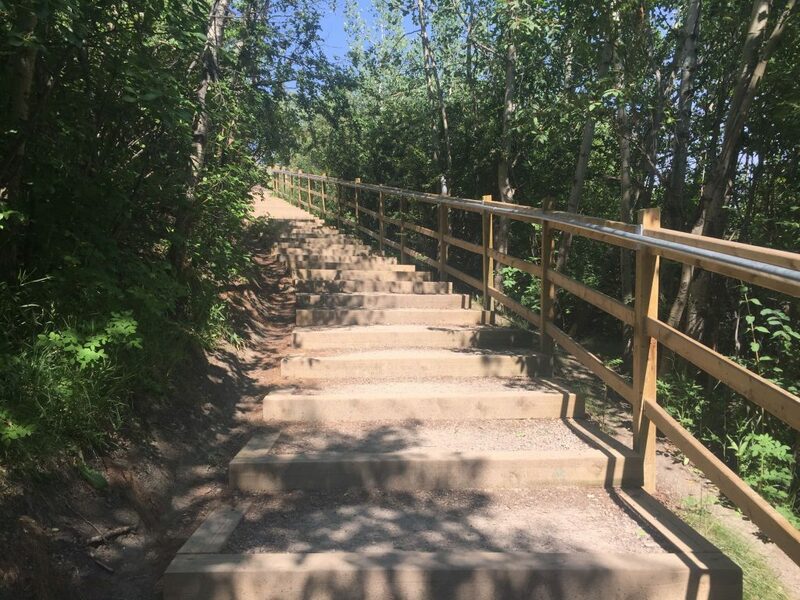 Known as the “secret stairs” (by us, at least) these steps were added as part of the River Park, Sandy Beach and Britannia Slopes redevelopment in 2016. 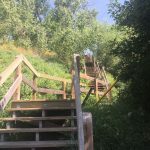 This curving staircase takes you up the aspen-covered hill from Sandy Beach to the River Park off-leash park. 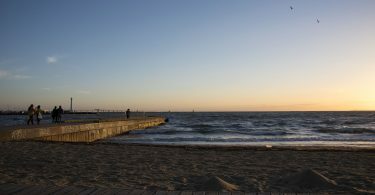 The steps are inconsistent depths, which keeps things interesting and makes for a great, challenging workout (think lunges). It’s magical here when the leaves turn in the fall. 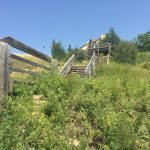 We’re not kidding about the “secret” thing: Park at either end of Sandy Beach, find the paved pathway that runs along the base of the hill south of the bridge, and keep your eyes peeled for the Y-shaped gravel path leading into the woods. 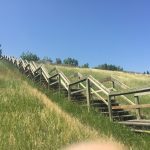 Tucked behind the Glencoe Club in Elbow Park (follow the east parking lot to the hill), this pretty staircase takes you to Upper Mount Royal, where you can gaze over south Calgary while catching your breath. There’s a small break at about the 100-step mark where you can either keep going or turn right and complete the ascent up a comparatively gentle dirt path. Caution: While this is a popular workout spot for nearby residents and Glencoe Club members, it’s nowhere near as packed as McHugh Bluff. Nonetheless, use your best stair workout etiquette: no tailgating, no ostentatious spitting. Park on Salisbury Ave. SE in Ramsay and look for the wooden railings opposite Burns Ave. 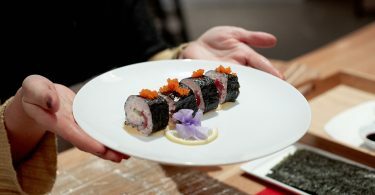 SE (more or less). 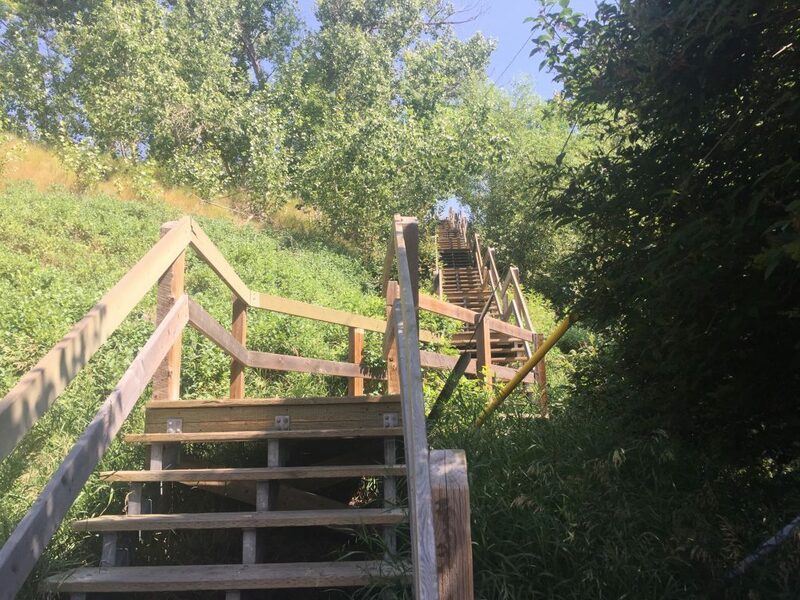 The steps, clear at the top and enclosed by shrubs and trees toward the bottom, lead down Scotsman’s Hill to the Elbow River and Enmax Park. 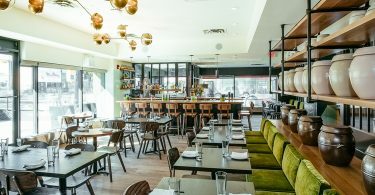 Go in the evening, and — depending on the night — you’ll enjoy the company of sports fans and concertgoers heading down to the Saddledome or fireworks enthusiasts heading up to the view. Remember to stretch: In other words, take a few minutes to hang out after your workout and enjoy the view over Victoria Park and downtown. Find the paved pathway sandwiched between the Westhills Superstore and the Signal Hill Library and follow it to the foot of the stairs. 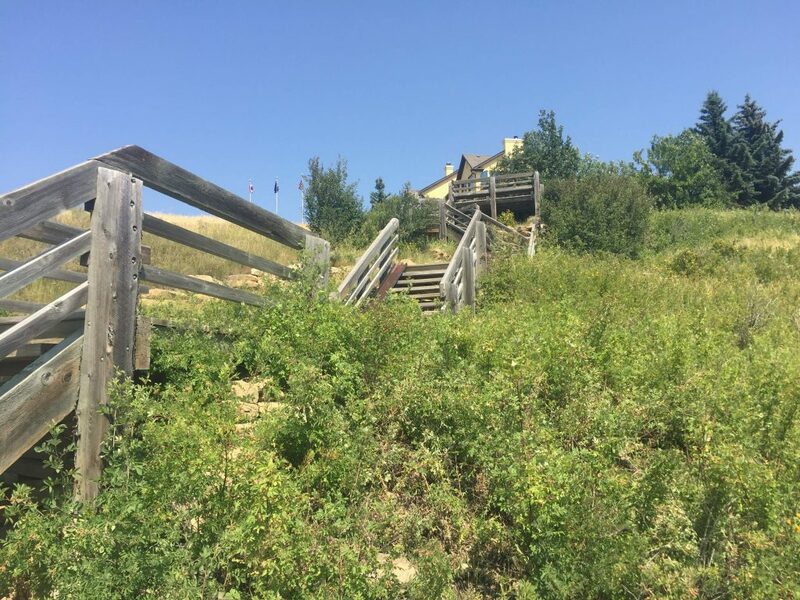 This is a workout in two sections, with 82 steps climbing to a stretch of pathway that leads to a second set of 90 steps. At the top is Battalion Park, where you can get a close-up look at the thousands of whitewashed stones that make up the big Signal Hill numbers, which represent four Canadian Forces battalions. Tip: If you want to descend the faster, more face-breaking way, use the unusually wide metal bike ramps as slides. What could go wrong? You don’t want to waste time shopping for your post-run glass of wine if you want to maximize your workout. 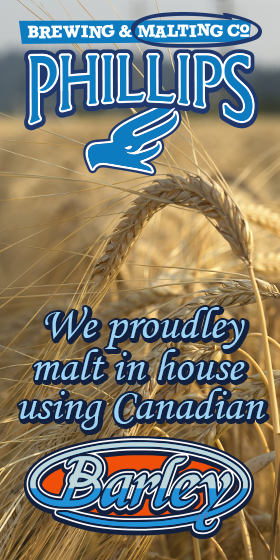 Find out how you can do just that and skip the liquor store.